Dr. Todd Smith will attend the 2014 Sequencing, Finishing and Analysis in the Future meeting this week to discuss the use of genomics and proteomics data in education. This annual meeting is attended by experts in the genomics community who gather to discuss computational tools and technologies for nucleic acid sequencing. What bioinformatics skills should be taught to undergraduate biology students? 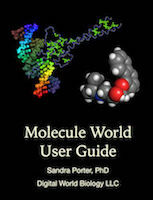 Dr. Porter, founder of Digital World Biology, will be on-site at the 16th Annual Bio-Link Summer Fellows Forum to answer questions about Molecule World and assist instructors who plan to introduce bioinformatics in their classes. A grant from the Amgen Foundation will be funding Dr. Dina Kovarik from Digital World Biology, and Adrienne Houck from Shoreline Community College, to work together to provide high quality professional development opportunities for Washington area high school teachers over the next two years through the Amgen Biotech Experience. Teachers participating in the project work with red and green fluorescent proteins and learn about DNA extraction, cloning, and bioinformatics.